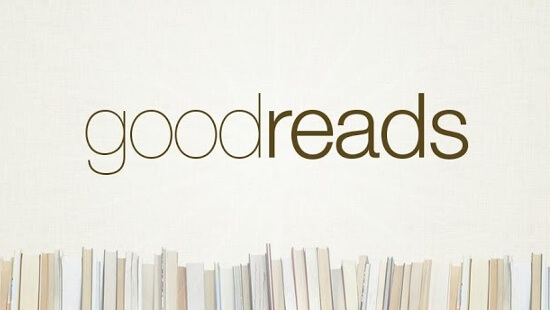 Ready, set, READ! Monster Trucks is officially out in the world! In honor of its release day, I thought I’d share a little backstory, and give away a signed book! 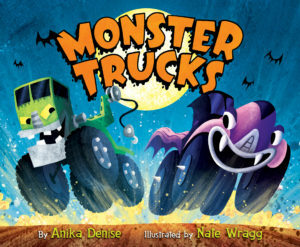 When I first began telling people my new book mashes traditional “scary monsters” with trucks, the most common response was, “I can’t believe no one’s done this before.” And that’s exactly how I felt when the idea came to me. I’d been chatting with my cousin, who said her young son would only read books with monsters or trucks in them. I half-jokingly replied, “He needs a book with both. I should write him one!” But then I promptly talked myself out of it. Someone’s done this book already, I thought. Someone must have. Just before drifting off to sleep, though, the first lines raced through my mind. Quickly, I jotted down the words before they sped off and vanished into the night. In the morning, I made notes about possible characters for my spooky speedway race: Frankentruck, Zombie Truck, Werewolf Truck, Ghost Truck and Vampire Truck. That’s when I got “the feeling.” Writers, you know the feeling — the dare-I-believe-it inkling that this could be a winning idea. It’s typically followed by the desire to get to your laptop immediately. So, I typed my title in the search box and hit return. Results came up for a board book, a few nonfiction titles about monster truck rallies, and there was an adorable Little Golden Book with illustrations by the über-talented Bob Staake, featuring a truck named Mudenstein. Hmmm. Similar… but not so similar that I felt I should abandon my idea. The story I wanted to write, would feature a full cast of menacing monster big rigs in a high-octane race. I’d add an unlikely heroine. And of course — a twist. That all makes it sound too easy, but believe me, like any idea, it took many drafts; feedback from my amazing critique partners Jamie Michalak, Kara LaReau and Kristen Tracy; input from my dear husband, who helped me rev-up the ending; and a final round of comments from my rock star of an agent, Emily van Beek, before it was submission-ready. When the book sold to Nancy Inteli at HarperCollins, I was glad I’d stayed the course. And I was super-excited when Nancy suggested approaching Nate Wragg (Goldi Rocks and the Three Bears; 10 Little Ninjas, Elwood Bigfoot) to do the illustrations. Nate’s Monster Truck characters are perfect for the text. And I adore all the fun monster-ish details he added to the spreads. 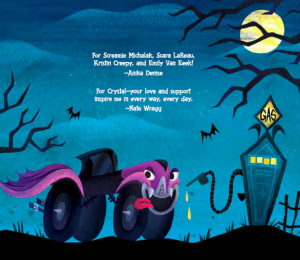 Picture books are collaborations, and it’s truly a thrill to see how magically Nate brought our “spooky speedway” to life. So, I guess this is all by way of saying thank you — to Nate, my agent and editor, my writing group, my sweet and supportive husband, and to friends and family — who have been sharing and tweeting “happy book birthday” wishes. A writer’s life is not for the faint of heart, but when the checkered flags fall on this book release day, I can tell you, without a doubt, I feel like a winner — with an amazing team supporting me. And because it’s release day and I’m feeling big love and gratitude, I will send a SIGNED COPY to one reader who leaves a comment below. Vroom, vroom! My grade one class will love this book! Can’t wait to read it to them in the fall! What fun it will be! Looks like just the thing for my K-4 library. Congratulations! Looks like a book my 2nd graders would love!! Happy Birthday Book! What an amazing journey. Can’t wait to read and share your book. What a clever book. I’d love to add this to my library! Monster Trucks looks amazing!❤️ Congratulations!/¡Felicidades! Would love to win a signed copy Keep writing, Anika Denise! Happy book birthday. This looks adorable! Congrats to you and Nate Wragg!